A while ago I saw various tweets in my timeline claiming that you get free short stories in French train stations now. I had this tweet and similar ones in my timeline several times. I still follow a lot of book people from my time as a librarian. And I actually followed the links, read the French article on it and discovered that one of the machines is at a TGV station very close to where I live: Massy-Palaiseau. 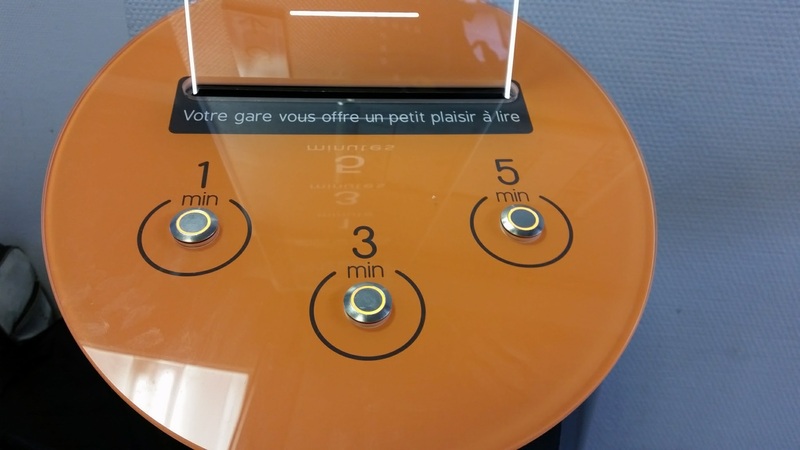 So when I recently went to Paris I made a stop in Massy to check out the magic short story machine. 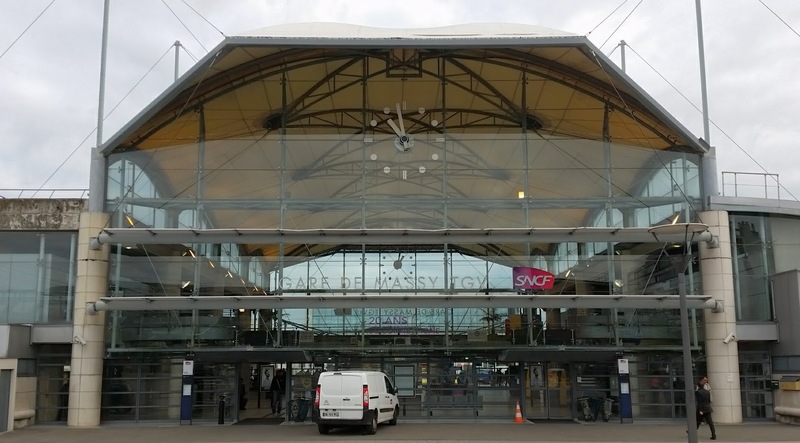 The TGV station is right next to the RER station (the suburban train lines). It’s not a big TGV station by any means and it doesn’t serve many routes. I wandered around it, looking for the short story machine. I had my phone out and camera activated and hoped I wouldn’t draw attention. I started wondering if it’s even allowed to take photos inside train stations anymore and if the machine gun toting soldiers I saw last winter are still around here somewhere. It’s not easy for me to act normal when I think about what I’d say to someone holding a gun if they asked me to explain what I was doing. It turns out the constant security announcements (in the vein of “if you see something, say something”) don’t do anything. I must have looked guilty as hell mulling all these things over in my mind while clutching my phone and looking closely in every corner of the station, but nobody took any notice. I finally found the short story machine in one of the two waiting areas. It had a large sign advertising free wifi outside. Everyone inside the waiting room was looking into their phone. 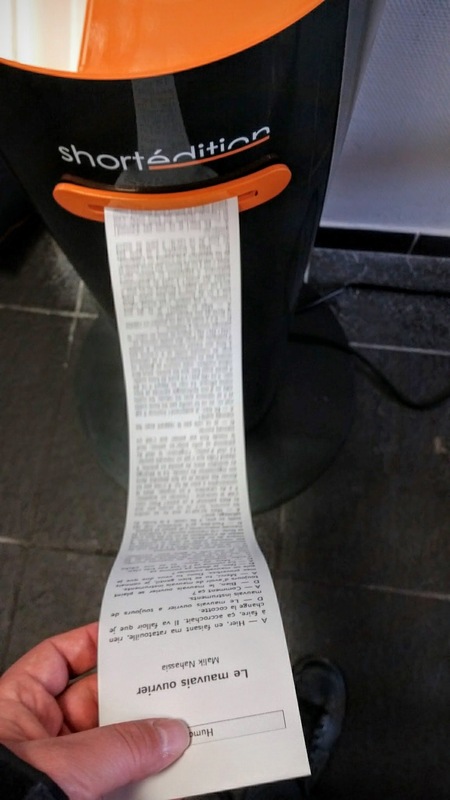 I didn’t look too closely, but nobody appeared to read a short story printed on a strip of paper. Behind the machine is a conveniently placed but unused outlet – something I don’t see often at train stations! And next to it on the left there are tags. Apparently you have to have luggage tags in the TGV now as well. 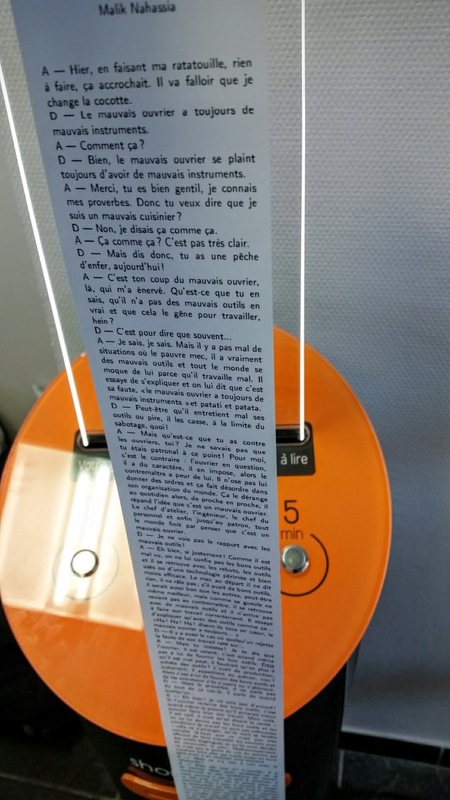 The machine really is extremely simple – you press a button depending on how long the story should be (1, 3, or 5 minutes) and out comes a long stip of paper with the story. When I saw the format, I assumed it would be the kind of paper that receipts are printed on, but it’s pretty sturdy actual paper. It’s free by the way! Despite all those tweets calling it a vending machine, there’s no money involved in acquiring a short story. I would have loved to stay a little and print out more stories and compare the length and see how many different stories there are. But people were looking at me and I was on my way to Paris, so I left it for a later time. I actually timed myself reading the short story later that day. The 3 minute story took me 5 minutes to read. It was entertaining enough and not too diffcult for me to read. I found it was trying a bit too hard for the final punch line, though. 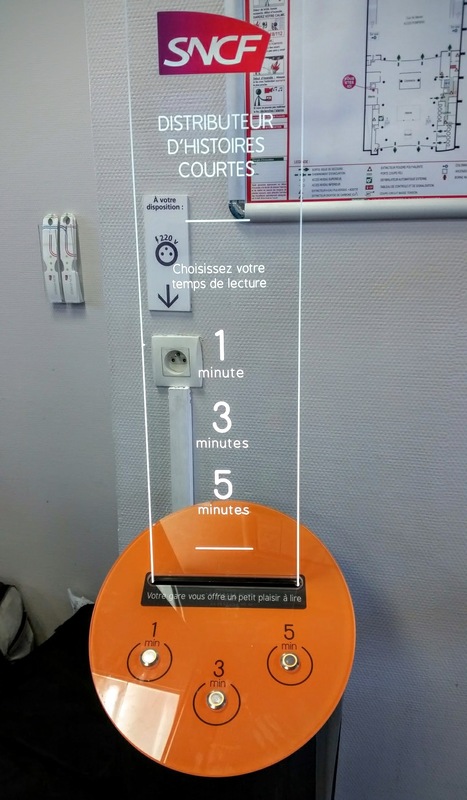 The stories come from short édition, where you can see better photos of the short story machine and you can also download more short stories or très très courts, as they are called apparently. Massy, photos, reading, security, short stories, train stations. permalink.